YIP.7.30 – hooked!, originally uploaded by earthchick. 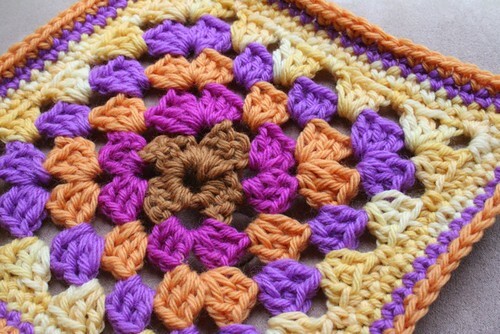 When I was 8 years old, my Aunt Bonnie tried to teach me how to crochet once while she was visiting. She brought me a hook and some orange acrylic yarn and showed me how to make a foundation chain. I really enjoyed it, but then her visit was over, and she lived far away, and I had no one else to show me what to do next. 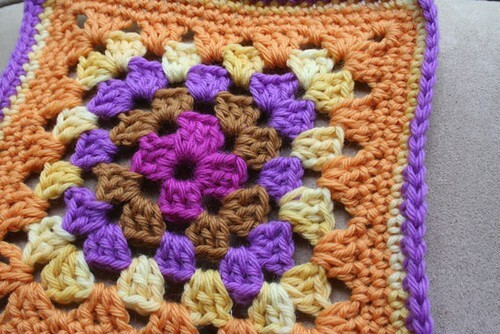 I kept that orange chain in my desk for years and always wondered how you could make something like an afghan starting with a small chain like that (my grandmother cranked out ripple afghans for the whole family on a regular basis – in fact, it was really the only thing I knew about crochet, was that you did it to make afghans). When I was on vacation, my Aunt Bonnie died suddenly and unexpectedly. When packing for my vacation, I had packed one crochet book, on a whim. After my aunt died, I found myself compelled to start crocheting. For days on my vacation, that is the only craft I did. It helped me feel close to her. And also – it is completely addictive. I had some yummy colors to work with, left over from a knitting project I had just finished (soon to be shown). 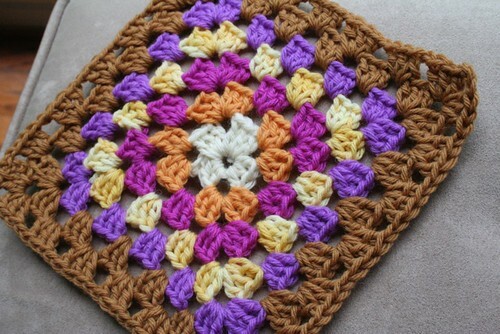 I finally made the one thing I’ve always wanted to crochet – granny squares. I love it that there is orange in each of them, a little nod to that orange yarn Aunt Bonnie tried to teach me with 30 years ago. These make me ridiculously happy. The colors are sooo juicy, and I can hardly believe I’m finally crocheting after all these years. I just want to make more squares. And more! I have no idea what I’m going to do with them. The colors are lovely, what yarn is it? What a sweet tribute to your Aunt Bonnie. She finally did get you crocheting! Those are beautiful and the photography is amazing. Well done! Look at you, Miss Crocheter! How impressive. So sorry to hear about your aunt and glad you could be with your family so soon after losing her. Very pretty – I love the colors! Sorry to hear about your aunt, but what a great way to remember her. You are so funny! I have been crocheting for over 30 years and these are adorable! 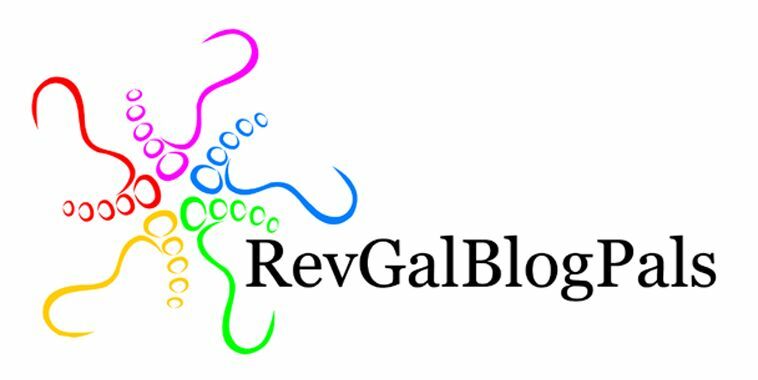 Welcome to our world! I am left handed and I was taught by a friend who is right handed. I don’t crochet left handed, but a mirror of right handed. So most people who crochet are confused when they watch me work! Is that confusing enough? 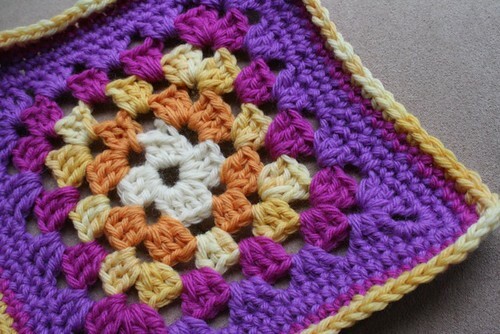 I haven’t made granny squares in years and I still don’t know how to make that ripple afghan! But I make hats, scarves baby and doll blankets.